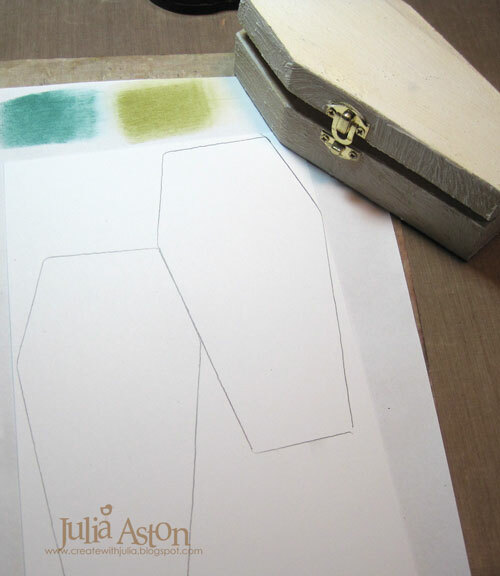 Julia Aston here today - to welcome you all to the last leg of our Destination Inspiration for October! Today we have arrived at Terminal 4 and I have something to share with you using all the supplies in our October Travel Bag. I've got lots of photos to share of my creative process. 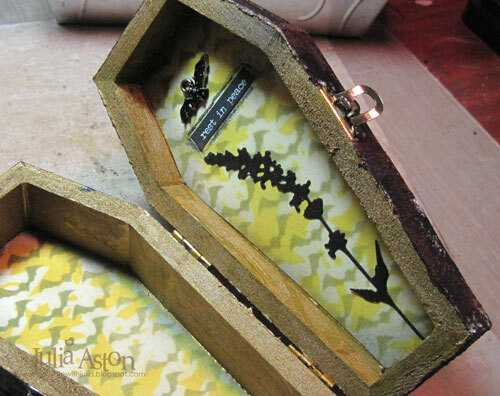 I had this little coffin box (5 1/2" x 3") that I had bought several of last year, post season, at half price! 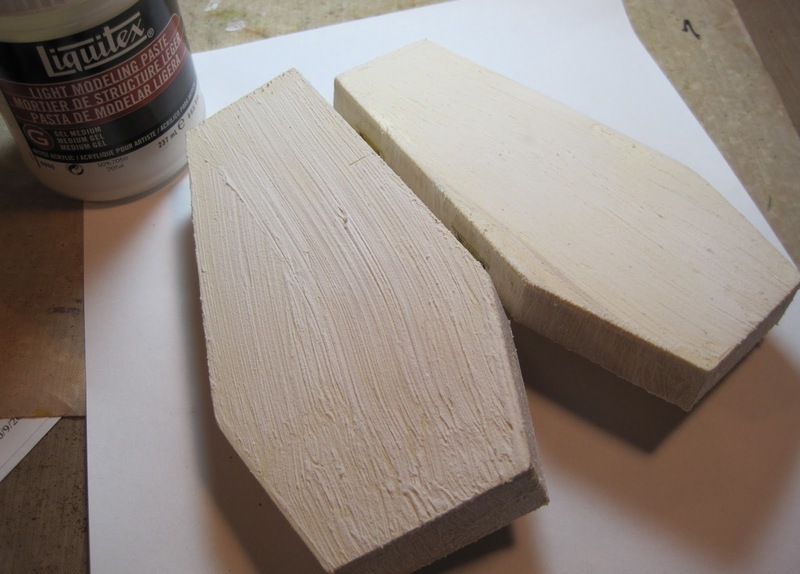 I ran out of white Gesso (actually I had a big jar of it but when I went to use it, it was all dried up!) and so used some Light Modeling Paste to seal the surface and add some texture. 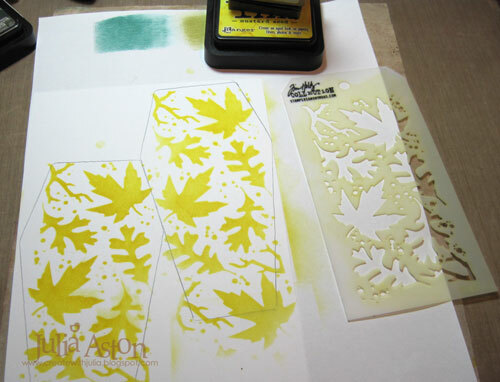 Then I sponged with Distress Mustard Seed using Tim's leaf stencil over the tracing. 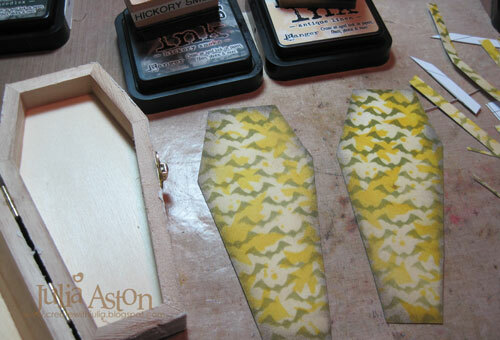 I cut out the pieces 1/4" smaller on all sides so they'd fit inside, sponging over the entire pieces with Distress Antique Linen and then sponging the edges with Distress Hickory Smoke. 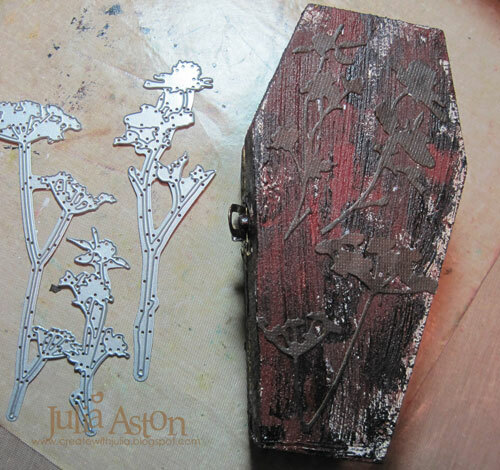 The inside was decorated with a bat, a Small Talk sticker and a die cut stem - the inside, being protected from the harsh elements is much cleaner than the outside! 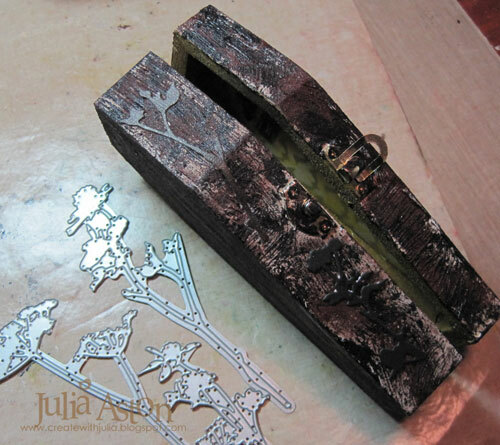 Next I wanted to create a weathered exterior - like the coffin had been in the ground for 100 years or so! 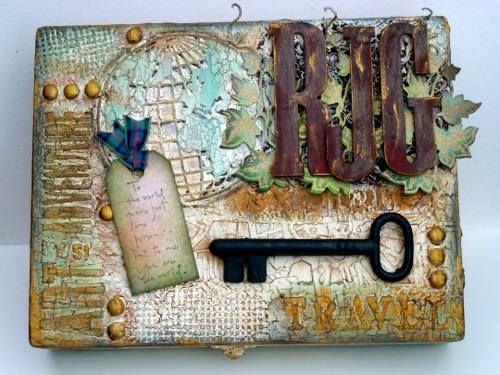 I layered on patches of Acrylic Paint in Burnt Umber, Burnt Sienna and Paynes Gray and let it sit to dry. 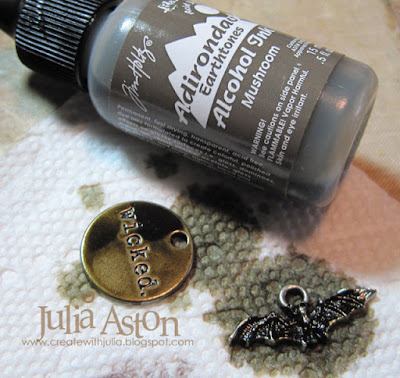 I dropped some Mushroom Alcohol Ink onto a wicked tag, a bat and a spider (not shown), drying them with my heat tool. 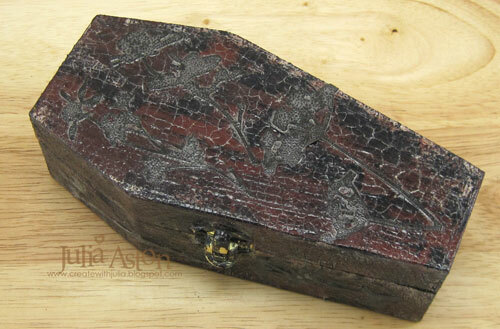 The person buying this coffin was quite wealthy- no plain pine box for him - his was decorated with lovely floral stems cut out of black Cordinations paper using Wild Flowers Thinlits. Both on top and on the side! Now that the outside paint has dried and stems are affixed - I spread on some crackle finish rather thickly, then let it sit over night to dry. 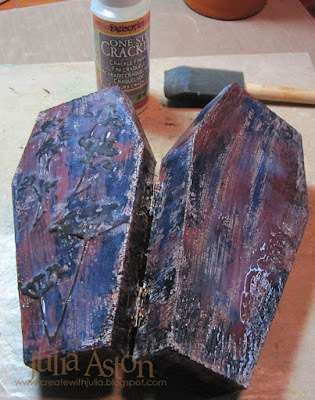 So here is the newly exhumed casket all crackled and weathered - dug up today so the occupant could properly celebrate Halloween. 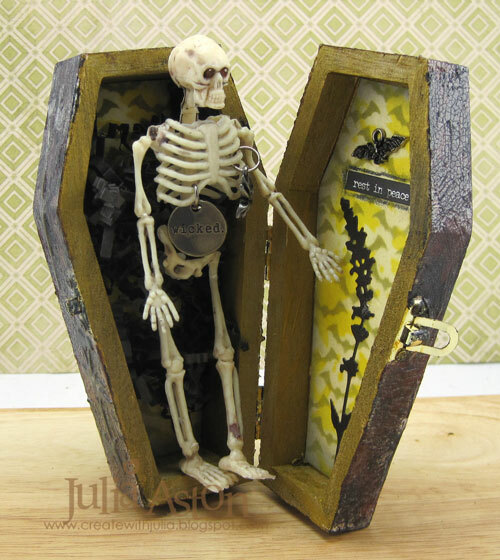 He just couldn't wait to get out - and since he was too long for his own casket - it seems his legs had to be folded up to fit in - it was easy for him to just push out his legs to open it up!! A spider has found a home in his rib cage apparently - his eyeballs have become glowing golden orbs, and someone labelled him 'wicked' which may give us a clue to his personality when he was alive...???! And here he is at full stature - ready to scare and spook us on this All Hallow's Eve!! 4 Terminal Stops in October in case you missed one. 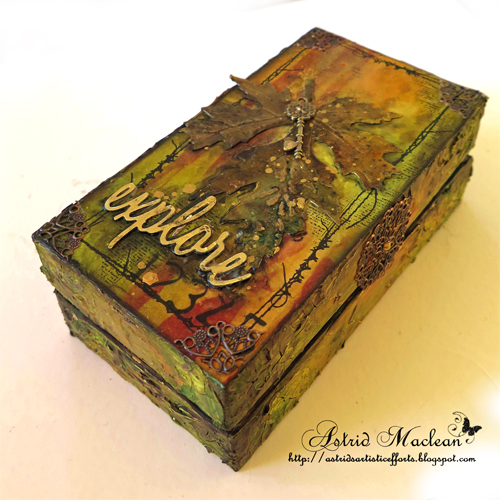 And don't forget Anne's October AVJ challenge - Make it Spooky - you have until Thursday, November 3rd to link up your project! 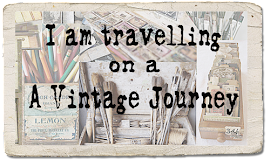 Thanks so much for stopping by at A Vintage Journey - Next Monday we'll start out at Terminal 1 again with a whole new Travel Bag of 'tricks'! 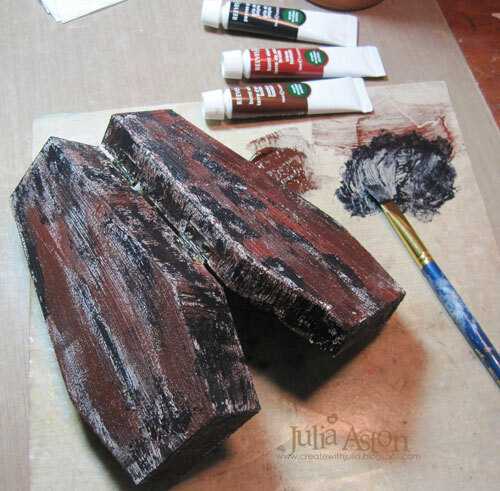 Wow Julia, this is awesome! 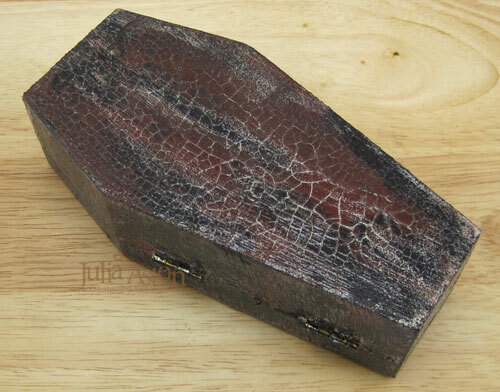 Your coffin really looks weathered which has spent the last 100 years under the ground! But my favourite is the inside cover with the bat-leave combo stencilling! 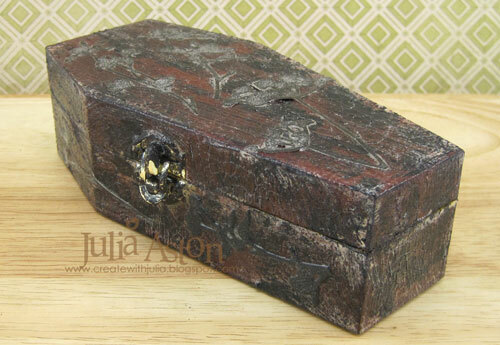 Wow Julia, what a stunning bit of Halloween decor, perfect for today! Brilliantly put together and happy halloween to you!! 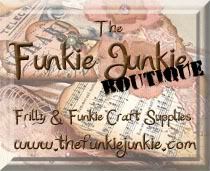 WOW these are all fabulous! 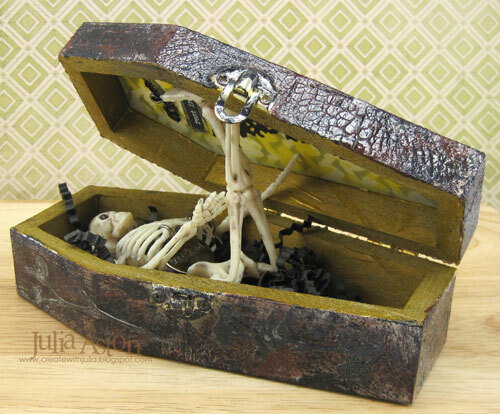 Loving the coffin and skeleton. 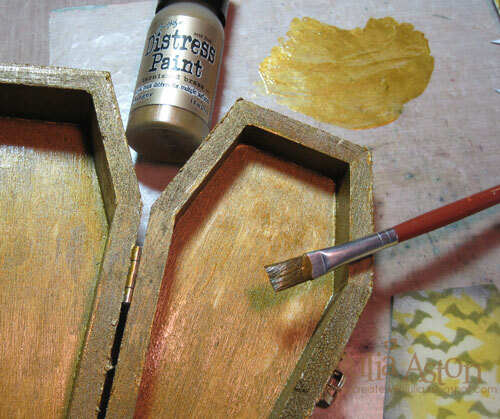 A delightful terrific coffin! I love the flowers branch detail... so smart! Such a cool project! Julia Love how you have themed it around the day of your post - it being Halloween. 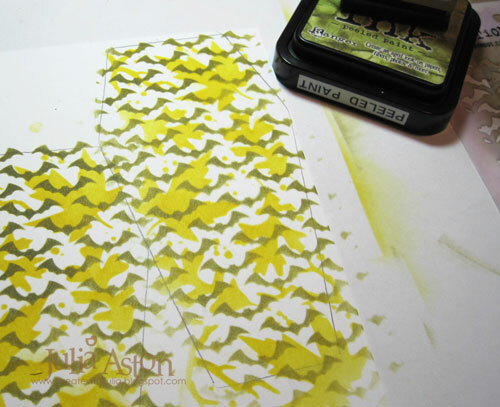 The leaf and Bat layering stencils work so well together especially in the colours you chose . Great contrast between the cleaner interior and the weathered exterior- the crackle is fantastic. 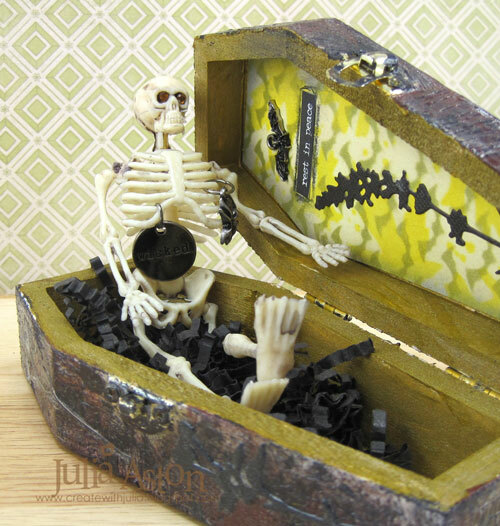 Your skeleton just adds so much fun and humour to your project too - You had me smiling when he had to bend his legs over to fit lol . 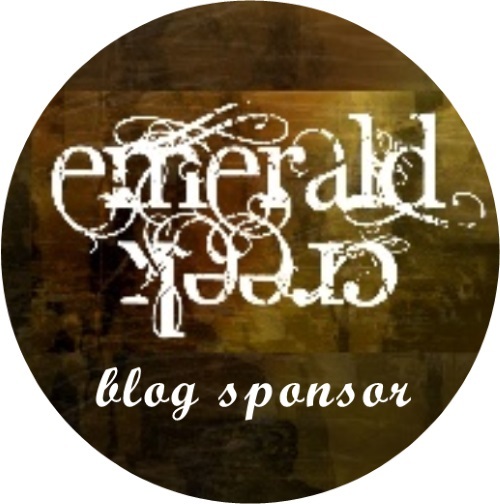 A great month of Destination Inspiration posts .